My druid, Shae, and her original Teldrassil Sproutling! He seems to have fallen asleep. He's so lazy. He'd usually find a spot to snooze smack in the middle of the raid, preferably in fire. I’ve been working on my various collections lately. Due to my history with changing mains, my achievement hunting has been hindered in some regards. For example, I started collecting pets with my druid and more or less had to start from scratch with Millya’s collection. This is the background story behind why I was seeking the Argent Tournament pets, so long after the Argent Tournament’s conclusion. It happens that I think the AT pets (all of them) are some of the neatest pets in the game. 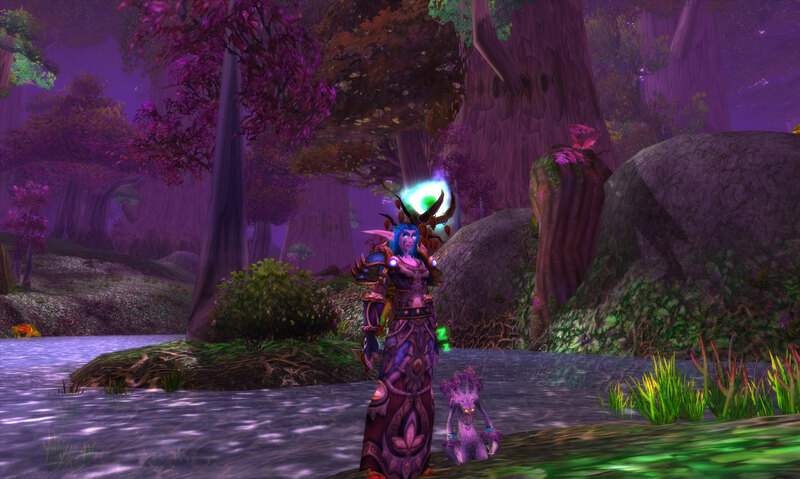 My Teldrassil Sproutling was my constant companion for druid healing. It was pretty easy to just quest until I had enough Champion’s Seals to get the Alliance ones for Millya! Where I ran into some trouble was trying to get the Horde ones. Back on my old server, I’d just spent a bit of gold to buy them for my druid. This was when the Argent Tournament came out, most people were doing it every day, and that server had a healthy Horde population to match the number of people playing Alliance. My current server doesn’t have that. There aren’t very many Horde players there, period. Some of these pets are up for sale on the neutral AH (or people transfer them over) but for exorbitant prices. And why not? They do take some time and effort to obtain, and the low population keeps them fairly exclusive. I could probably have afforded to buy them all. But I thought, there has to be a pet collector on the Horde side who also doesn’t want to spend 6000 gold per pet to get the Alliance version. I made a post on my realm forums to the effect of, “Looking for Horde to trade AT pets with.” They cost 40 Champion’s Seals each, so we could just straight up trade. Alliance pets for Horde pets! After about five days and no replies to my thread, it wasn’t looking good. I thought I’d been too ambitious. Maybe Moonrunner’s Horde players aren’t pet collectors, or else it was so easy to obtain the pets that they’d all collected them ages ago. Then Fsob mentioned to me, “Hey, did you see someone responded to your thread?” I’d stopped checking it! A Tauren warrior had replied saying he thought he had some seals left over. I sent him an in-game mail (Horde-side) to ask him which Alliance pets he most wanted. I didn’t think I had enough seals for all five, but I definitely could get three right away. We played a bit of message tag until Sunday, I logged in and found a message from an Alliance character of his, and the character was online. We started talking, he was mostly asking how he could get the pets to me. It was the next part that flabbergasted me. He wouldn’t hear of taking anything for them. His Alliance character didn’t need anything. He suggested we make the switch then, if I had time. I made my way to his character in Orgrimmar, still completely floored. There they were in the trade window, all five of the pets. I thanked him repeatedly and told him that if nothing else he’d made a friend Alliance side and if he ever needed anything at all, I wanted to help him. A little bit of Mulgore wildlife. Hey, Draenei can appreciate creatures from all over Azeroth, right? This is undoubtedly the kindest thing a complete stranger has ever done for me in WoW. He suggested that if I wanted to ‘repay’ him I could just pay it forward and do the same thing for someone else Horde-side. It’ll take me a bit of time to get all the Seals and find the right person, and I just might do that, or think of something equally momentous to do. Best of all, I will not be able to take out any of the new pets without thinking of this generous Tauren and his completely unexpected gift. I think it will always make me smile, and so not only do I have new pets, they also mean something. Has a stranger in WoW ever done something really nice and totally unexpected for you? Did you do something nice for someone else in return, or maybe even without the initial catalyst? If you find yourself inspired yourself, let me know, I’d love to read about your experiences. I like to generally believe that all people are basically good, I love when the universe tries to prove me right!